Healthy pop 94% fat free butter microwave popcorn delivers a great butter taste with hardly any fat. Endorsed by weight watchers, healthy pop is high in fiber and has just two grams of fat per serving. This diet popcorn has no saturated fats, no trans fats, and no cholesterol. Our healthy popcorn is also made with 100% whole grain, gluten-free, and non-gmo popcorn kernels. All this, plus the irresistible, taste of hot-buttered popcorn you crave. It's the perfect healthy snack for your busy lifestyle. The high fiber content of healthy pop supports weight loss by filling you up so you don't over-eat. One serving is equivalent to 3 weight watchers points. 100 calories per serving. 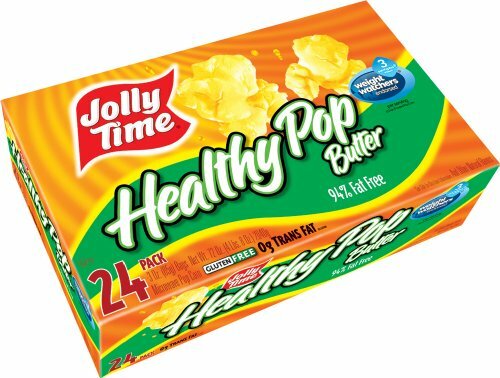 You will be receiving 24 (3.5 ounce regular sized) bags of jolly time healthy pop butter 94% fat free microwave popcorn. If you have any questions about this product by Jolly Time, contact us by completing and submitting the form below. If you are looking for a specif part number, please include it with your message.